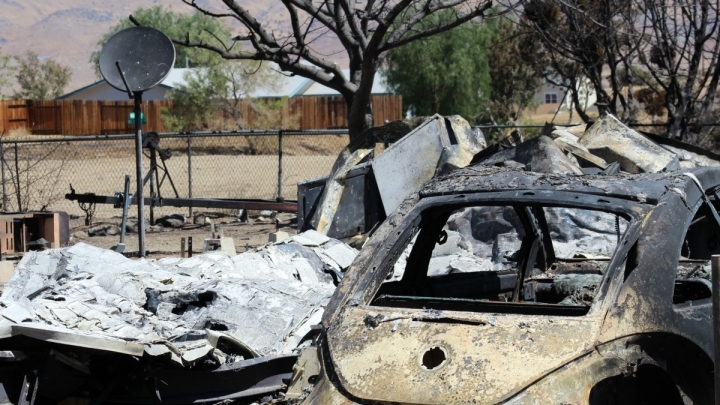 The Erskine Fire spread so quickly in southern California earlier this year that some residents died before they could flee. The number of acres of forest burning yearly in large Western fires ballooned nine-fold from 1984 to 2015, with climate pollution and natural changes in the weather playing roughly equal roles in driving the deadly trend, research published in Proceedings of the National Academy of Sciences concluded. The study showed that more than a century of fossil fuel burning, deforestation and farming has helped push the American West into an explosive new wildfire regime, and the findings suggest far worse could be ahead. “The authors clearly demonstrate that a human influence on wildland fire as a consequence of global warming isn't just a prediction for the future — it's happening now,” said Kevin Anchukaitis, a University of Arizona scientist who was not involved with the study. 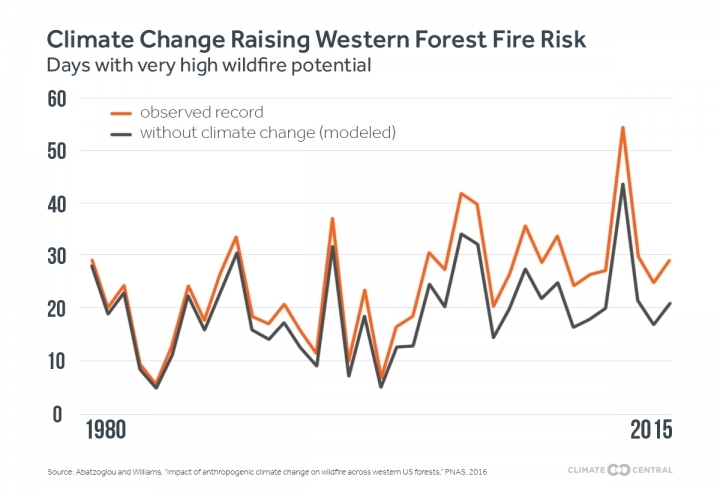 Previous efforts to link Western wildfires with climate change have hinted at a profound relationship but led to unconvincing results, largely because long lists of factors influence ignition and wildfire properties. Monday’s study focused on forest dryness, identifying the commanding role it has been playing in driving fires. The researchers relied on climate data and modeling to present a sweeping regional view of 30 years of worsening forest fires. Western wildfires have been devouring forests parched by higher temperatures in recent years, draining federal and local firefighting funds, killing residents unable to flee fast-moving flames and filling skies with sometimes-crippling levels of air pollution. The new analysis showed temperature increases caused by rising levels of greenhouse gas pollution have had a drying effect on Western forests that caused 10.4 million acres to char in large fires during the three decades. That suggests 44 percent of the forest area that burned during the three decades analyzed burned because of the effects of global warming. The finding was an estimate, with the researchers concluding global warming likely drove between 6 million acres and 16 million acres of forest fire. Greenhouse gas pollution was also found to have extended fires seasons and caused additional days of severe fire danger. The “compounding effects” of climate change and natural weather fluctuations are “giving rise to this remarkable increase in forest fire activity,” said John Abatzoglou, a geographer at the University of Idaho who coauthored Monday’s paper. Even as greenhouse gas pollution has warmed the planet’s surface in recent decades, warming rates across the West have been exceptionally rapid. That’s largely because of the effects of a slow-moving ocean cycle, the Pacific Decadal Oscillation, which influences the global climate. 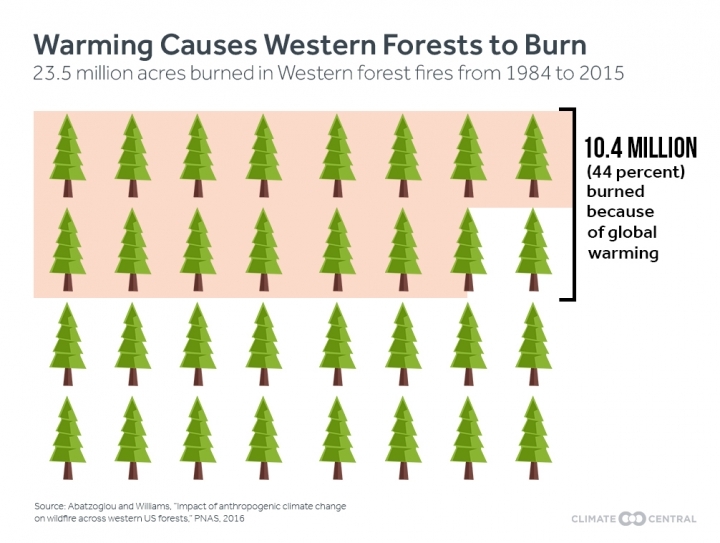 Warming caused by natural climatic variation was blamed for the burning of 11.4 million acres of Western forests during the study period — slightly more than the effects of warming caused by humans. The study focused on the heavy role that temperatures can play on forest fires, ignoring other kinds of wildfires, such as those afflicting grasslands, and ignoring other factors that can shape fire seasons. Fires need ignition sources to get started — these include lightning strikes, arsonists and campfires. They’re also affected by the thickness and type of vegetation that they consume, which in turn are shaped by weather, climate and wildfires. “While this paper is an important contribution, we still face several open questions about other drivers of change on fire regimes,” said Max Moritz, a fire ecology and management scientist at the University of California, Berkeley. He was not involved with the research. California Gov. Jerry Brown and Nevada Sen. Harry Reid have directly linked the “new normal” of Western wildfires with global warming. Monday’s findings lent scientific credence to these claims. A United Nations climate treaty will take force next month that’s designed to spur nations to work together to reduce their impacts on the climate, such as by ditching coal energy in favor of cleaner alternatives. Exhaustive work and escalating political commitment will be needed if the civilization-saving potential of the Paris climate agreement is to be realized.